Use Archive to save mail or phone messages, appointments, reminder notes, or tasks to a designated database on a local drive. Archiving items saves network space and keeps your Mailbox uncluttered. It also protects items from being automatically deleted. You can view archived items whenever you need to. You can also unarchive any archived item. When you archive an item you have sent, you cannot track the status of that item. The system administrator might specify that your items are archived automatically on a regular basis. Automatic archiving occurs every time the GroupWise client is opened. Items are archived from the mailbox the user is currently using. This means if you are in Caching mode, items are archived from your Caching Mailbox, and if you are in Online Mode, items are archived from your Online Mailbox. Some items such as appointments, might be scheduled to be archived before the actual appointment date. When these items are archived, they are removed from the Sent Items folder but remains on your calendar. This allows you to schedule items far in advance, without worrying about losing them from your calendar. When you move an item to a folder, it is not archived. Items in all folders are affected by the Cleanup options you specify in Environment Options, and by any archiving or cleanup options your administrator specifies. Archived items are never deleted unless you manually go into your archive and delete them. Mac: Click GroupWise > Preferences. Linux: Click Tools > Options. Click Environment > File Location. Specify the location of your archive directory in the Archive directory field. The required location for your archive is on your local workstation. Creating an archive on a network drive is not currently supported. IMPORTANT:If you run GroupWise on multiple workstations, make sure that the archive location you specify exists on only one of the workstations. After the initial creation of your archive, the archiving process occurs only if GroupWise can access the specified location. If the archive location exists on multiple computers, the result is multiple archives, which is a situation that you want to avoid. 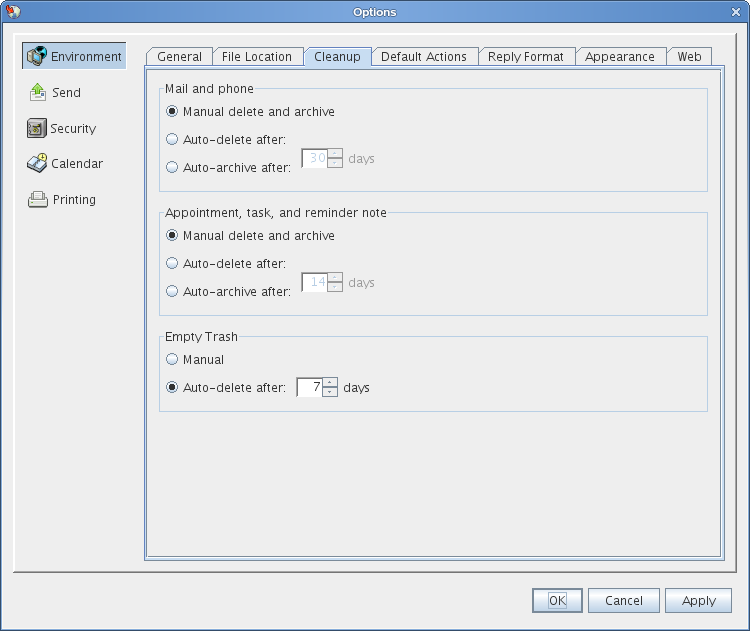 If you have not previously done so, specify the archive path in the Options dialog box. See Section 16.3.2, Specifying Where Archives Are Stored. Select the items in your Mailbox you want to archive. Click Actions > Move to Archive. When you archive an item you have sent, you cannot track the status of that item. Click Environment, then click the Cleanup tab. Select Auto-archive after for the item type you want. Specify the number of days after the item is delivered or completed that you want it to be archived. If your system administrator has specified that items are automatically archived on a regular basis, you might not be able to change this option. If you or your system administrator has set up auto-archiving of items in your Mailbox, items in the Tasklist folder are archived based on the original date you received the item, not based on the due date you assign it. If you have automatic archiving set up, it only archives items to one computer. If you are working on a computer where the automatic archive is not available, the items are not archived to the computer where the archive is not available. In the Main Window, click File > Open Archive. Click the Mode Selector, then click Archive. Click File > Open Archive. Click the item you want to unarchive, then click Actions > Move to Archive. Click File > Open Archive to close the archive and return to the Main Window. Click the Mode Selector, then click your user folder (your name) to return to the mode of GroupWise you were running previously. Unarchived messages are restored to the folder from which they were archived. If the folder has been deleted, GroupWise creates a new folder with that name. If auto-archive has been configured, then unarchived messages remain in your active mailbox for 7 days before they are moved back to your archive. If you or your system administrator has set up auto-archiving of items in your Mailbox, items in the Checklist folder are archived based on the original date you received the item, not based on the due date you assign it. You might want to move your archive from one location to another location in your computer’s file system. Click Environment, then click the File Location tab. In the Archive directory field, specify the location where you want to move your archive. NOTE:If you are moving your archive to a location where a GroupWise archive currently exists or previously existed, do not specify a directory that contains archive files. Archive files are stored in the ofxxxarc directory, which is a directory that GroupWise automatically generates as a subdirectory to the archive directory. If you specify the ofxxxarc directory as your GroupWise archive directory, the result is multiple archives, which is a situation that you want to avoid. For information on how to remedy this problem, see Section 16.3.8, Combining Archived Items from Multiple Archives. (Conditional) If you have not previously enabled archiving, you are prompted about whether you want to enable archiving. Click Yes. (Conditional) If you are moving your archive to a directory that does not already have archive files, you see a message asking if you want to move the contents of your archive to the new location. Ensure that this is the location where you want to move your archive, then click Yes. You might have items in multiple archives that you want to combine into one archive. In the GroupWise client, specify the archive directory that contains the fewest archived items. For information on how to specify an archive directory in GroupWise, see Section 16.3.2, Specifying Where Archives Are Stored. You must be on the physical computer that contains the directory where the archive exists. Unarchive all the items in the archive, as described in Section 16.3.6, Unarchiving Items. Specify your main archive directory. Archive all of the items that you want to move into your main archive, as described in Section 16.3.3, Moving an Item to the Archive. Repeat Step 1 through Step 4 for any additional superfluous archives that you might have, until you have archived items in only your main archive.